2018 is the year both big DSLR brands finally succumbed to the pressure to build high-end mirrorless cameras. But as first-generation cameras, what, exactly, did those companies put into building them? That’s what LensRentals founder Roger Cicala wanted to find out when he tore apart a new Nikon Z7 mirrorless and a Canon EOS R, spilling the cameras’ guts to show photographers what’s really inside. 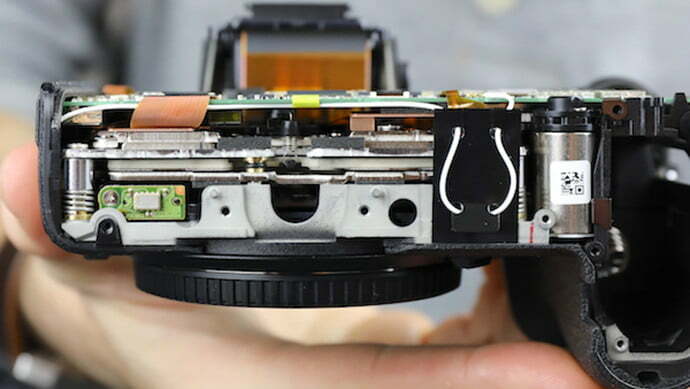 As a company that loans out cameras, the teardowns focus not on the sensor quality but on the build, durability, and weather sealing, inspecting the parts to make an educated guess on the longevity and expected common repairs on cameras that are heavily used as rentals. After tearing apart both cameras, Cicala said the Z7 is “as robustly weather sealed a camera as we’ve ever disassembled.” The EOS R, meanwhile, has a similar build and durability to the Canon EOS 6D Mark II DSLR, an entry-level full-frame model. Tearing apart the Nikon Z7, Cicala found weather sealing “everywhere we looked” on the $ 3,400 camera. The seals were more robust than on both the Sony a7R III and the Canon EOS R.
Inside, the Z7 doesn’t look too terribly different from a Nikon DSLR at first, until the team tore further into it to find the in-body stabilization system is (technology that isn’t present in Nikon’s DSLRs). From just looking at the construction, Cicala thought the stabilization system looked both robust and compact, which is good news for photographers concerned that the extra moving parts may compromise longevity. The teardown team also noted the camera’s magnesium alloy body. The parts that they didn’t see as so robust? A shallower tripod screw-in and a not quite so impressive diopter viewfinder adjustment. “This is not marketing department weather resistance, this is engineering department weather resistance,” he said. “Anything that can be sealed has been sealed.” He added that even with weather-sealed cameras, he himself uses baggies and rubber bands just in case. At $ 2,300, the Canon EOS R is considerably less expensive than the Z7 and shouldn’t be seen as a direct competitor (the Nikon Z6, at $ 2,000, provides closer competition). Cicala called the EOS R teardown “a rather boring disassembly” — but that’s not necessarily a bad thing. What was interesting was the amount of space left inside the mirrorless body, where cameras with in-body stabilization have a tighter fit. Canon has been toting the superiority of lens-based stabilization, so that space doesn’t mean there’s in-body stabilization coming to a future EOS R, but there could be room for it, Cicala noted. As for weather sealing, the buttons and dials are all sealed, but not much else. Cicalo says the weather sealing is similar to the Sony A7R III and can probably handle a mist but not a whole lot more. LensRentals doesn’t end the teardowns with a recommendation of which one to buy — after all, the company is only looking at the build and not performance and image quality. But, looking inside each camera reveals that Canon and Nikon aren’t cutting corners in construction compared to their DSLRs, with build quality that should satisfy customers shopping at each camera’s price point.